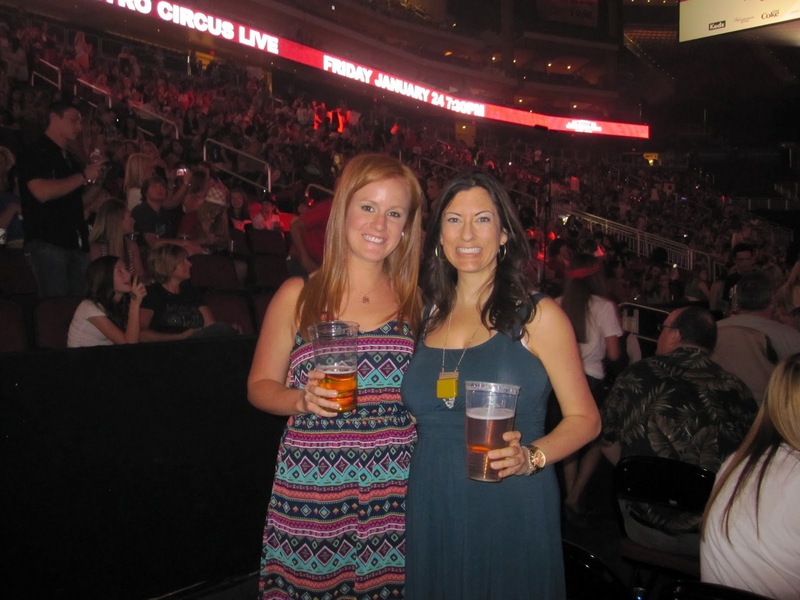 Last week, Taylor Swift came to town for two nights as part of her Red tour! T-Swift is my absolute fave! I love following her love life, buying her CD's and singing her songs in the car. Max knows this and surprised me in 2011 with tickets to her Speak Now tour, which fell on my birthday (best husby ever!). Moments before T-Swift made her appearance! She is seriously such the performer. 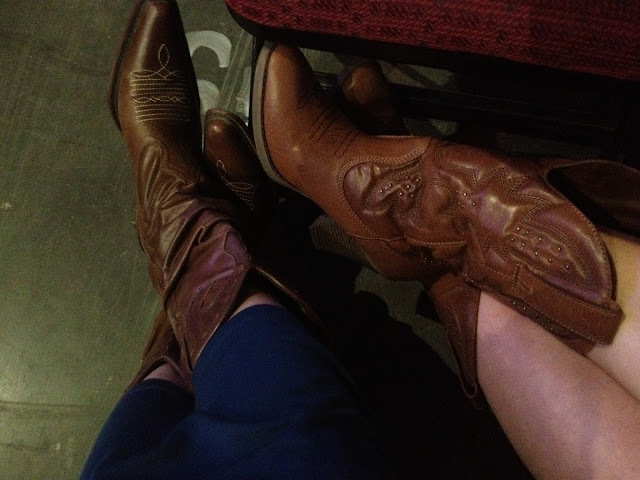 Every second of the concert was amazing, as was singing and dancing along! At some point during the concert, a security guard appeared next to me (I was the very last seat on the left in my row). I then noticed that there was a security guard posted at every single row, blocking off the aisle that separated the floor from the stadium seating (note the female guard at the row in front of me, stadium seating to the left). Hmmmm. 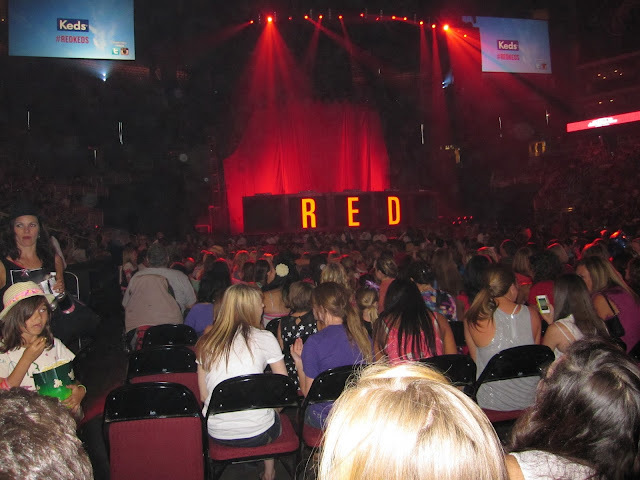 It didn't take long before we suspected that Taylor would be coming through the floor right next to us! 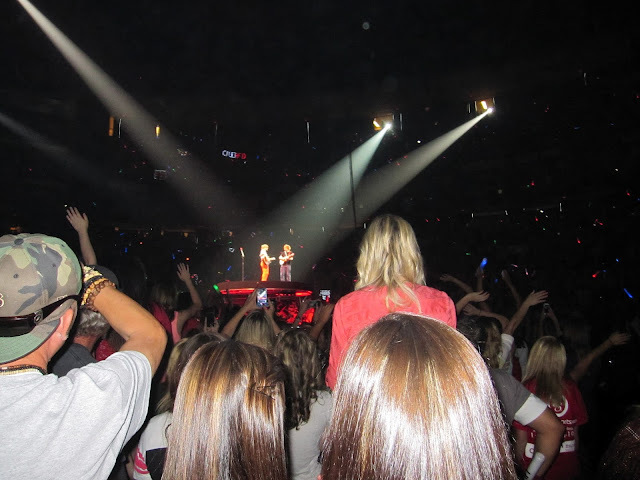 She did something similar on her Speak Now tour, heading to the back to perform a few songs for the far away fans. To our delight, our suspicion was confirmed when a rope went off blocking the space where the security guards stood. Bailey and I were giddy with excitement! T-Swift would be inches away from us! In an instant, Taylor began her song 22 and was then hoisted onto the shoulders of her backup dancers. This was it! In my mind I pictured her coming through while I politely snapped a photo and smiled, careful not to get to close to the security guard. Except that this is so not what happened. The second the crowd realized Taylor was coming through, everyone mad rushed the side where we were, desperate to get close. All of a sudden I was at the wrong end of a mob, totally being pushed around and knocked back into my chair. I panicked, thoughts of small people being trampled by mobs flying through my head. I realized I was deep into the rope, deep into the space where Taylor was coming through, and the crowd of people kept coming. I don't know how the dancers actually led her through the mess, but in an instant T-Swift swooped by and found her spot at the small stage in the back, finishing 22. Me, I was still facing forward hyperventilating from having my near-death experience. I realized this was specific to me as Bailey was happily singing and dancing, bubbling that she "touched Taylor!" Neither of us actually got a photograph with all the madness, though, go figure. When I finally turned around, Taylor had welcomed up Ed Sheeran to sing their duet, Everything Has Changed, maybe my favorite song on the Red album. My heart was happy again and I breathed a sigh of relief that I wasn't actually trampled by crazy Swifty fans. 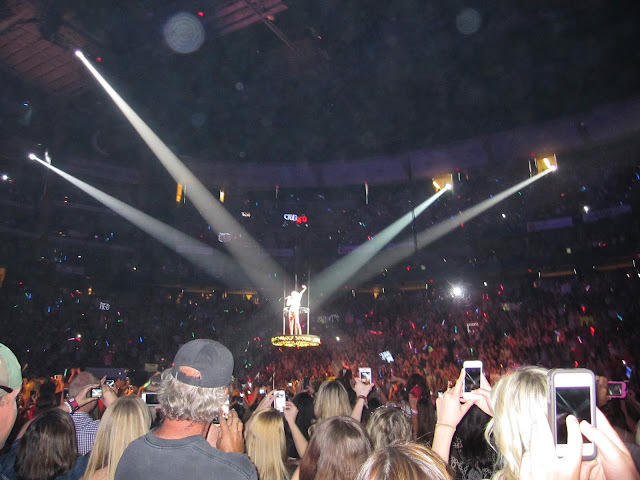 Of course Taylor couldn't dare return to the stage via the same route again, so when it was time she floated back while singing on a mini flying platform. Oh how I heart her. She ended the concert with sparklers and heart shaped confetti floating everywhere. Such a fun night! How was Ed Sheeran? I love him! He was awesome! I had no idea he was British! He performed an acoustic version of "No Diggity" - made me love him even more!